Most people when they think of energy efficiency don’t look beyond the immediate savings of their ENERGY STAR® products. We at Vinyltek look at the long term, our Windows and Doors need to meet your energy saving needs now and in the future but we also need to balance that out with environmental impacts. Don’t get me wrong we manufacture some of the most energy efficient windows on the planet, we just take care on how we do it. It is important that you choose the right Windows and Doors for your home, after all, according to the U.S. Department of Energy, Windows account for up to 26% of all heat loss from your home. It’s estimated that by replacing your existing windows and doors with more energy efficient windows and doors, you can reduce your energy bills by 7%. Savings are even greater in new homes, where it’s estimated that you lower energy bills by 12%. Vinyltek ensures these savings now and thanks to the quality and sustainability of our Windows long into the future. Vinyl does not conduct so helps to insulate your home both from the heat and cold. So, as well as helping with energy savings in both the winter and summer Vinyltek Windows and Doors manufactured using PH Tech’s PVC remain comfortable to the touch. Part of what makes Vinyltek Windows some of the most energy efficient windows on the planet is that we take Vinyl’s natural insulating properties and supercharge them with our multi-chamber design reducing thermal exchange further, with more enclosed air space than other brands, it increases insulation values without the addition of costly, less recyclable insulating material. In addition to superb insulating properties of our Windows and Doors, they are designed to be ultra-airtight, with triple weather-sealing you can feel the difference, and less air changes equal more energy savings. our high quality Windows allow for Triple glazed units to give them that little extra boost in performance. 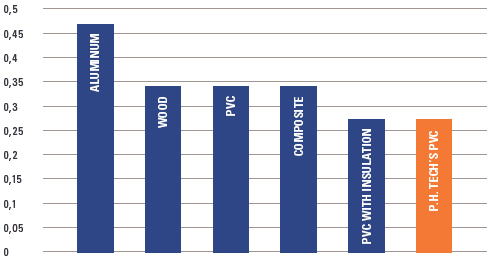 To summarise, what makes Vinyltek Windows and Doors some of the most energy efficient on the planet it’s because they are air tight, water tight, supercharged insulated from heat and cold with high performance glass, oh and we have the numbers to show it. We are proud to be part of the ENERGY STAR® program where we ensure that all the Windows and Doors we sell meet the requirements of Natural Resources Canada’s Office of Energy Efficiency. We are prouder still that year in year out 30 of our Window configurations continue to reach ENERGY STAR® Most Efficient, the highest rating you can achieve. CPD# – the ID number of the Certified Product. U-Factor – the rate of heat transfer. The lower the number the less heat transfer. SHGC – Solar Heat Gain Coefficient is the fraction of incident solar radiation admitted through a window. The lower the SHGC, the less solar heat it transmits. VT – Visible Transmittance is the amount light transmitted through a window. The higher the number the more light is transmitted. In addition to manufacturing some of the most efficient Windows and Doors on the planet, we are committed to helping the planet. In part this is done by using Vinyl to manufacture our windows, recycling all our waste product and reducing our energy usage amongst other initiatives. 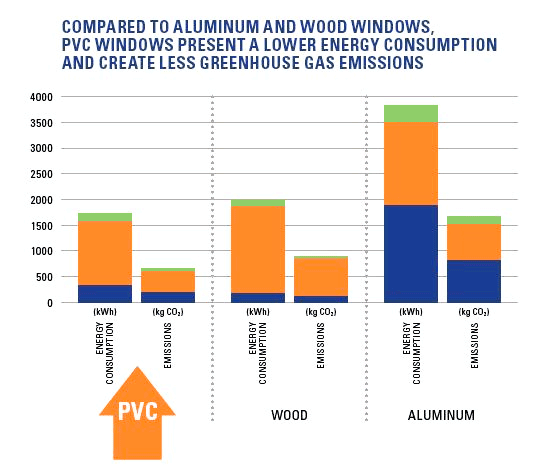 Contrary to popular belief, over the lifetime of a window, Vinyl windows present a lower energy consumption and create less CO2 emission by window type than comparable Wood and Aluminium windows. As with all manufacturing there is invariably waste but at Vinyltek we are committed to recycling everything we can, from left over Vinyl and broken glass to the toner and paper in the office, we recycle it all. In fact our waste is now 20% of what it was just a few short years ago and it continues to shrink. But it doesn’t end there, with the large investment in recent years in state of the art equipment and software we are moving towards a paperless manufacture process with huge benefits throughout the company. As with waste reduction we have committed to reducing the amount of energy it takes to build each and every Window and Door, from installing low energy lighting in the plant, energy saving equipment in the office and improving processes and optimisation we have and will continue to lower our energy consumption. We take an active role in projects that are redefining the limits of energy efficiency: we helped build Washington’s first Zero Energy Home and have been involved in several Ultra High Efficiency Home projects. Vinyltek has also been approved for inclusion on the Built Green Canada List. We invite you to visit one of our many showrooms throughout Metro Vancouver and BC. Connect with us to get started.